Jared Kushner, 25, new owner of the New York Observer, talks to a reporter in New York on Sunday. Kushner said he will work to increase advertising revenue, circulation and Web site traffic, but will leave editorial decisions up to the editors. 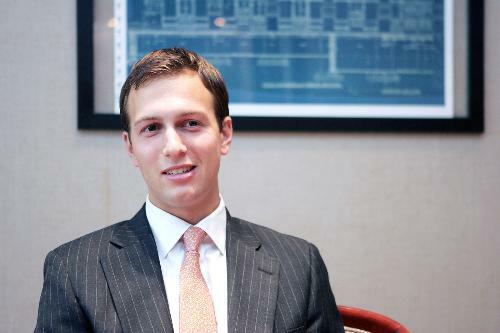 Jared C. Kushner ’03, the 25-year-old son of property developer Charles B. Kushner, has paid $10 million to acquire The New York Observer, a weekly, small-circulation newspaper that is influential in New York media, real estate, and political worlds. Kushner told The New York Times on Monday that he now owns a controlling stake in the paper, which currently loses about $2 million annually. He said that the money he invested was his own, and that he had earned it during his years at Harvard when he closed deals on nine residential buildings in Cambridge. Much of the backing for his investments, however, was supplied by family members. Kushner is currently attending New York University’s law and business schools. His younger brother, Joshua Kushner ’08, is an executive editor of Scene Magazine, a fashion and lifestyle magazine that was founded last year and has thus far printed one issue. Kushner will face challenges in turning around the Observer’s finances. He has promised not to interfere in the paper’s editorial content, saying, “It is up to the editors and reporters to decide what should be in the paper”—but has said that he will focus on boosting advertising and circulation. The Observer has been criticized for its upper-crust emphasis, principally its focus on the Upper East Side of Manhattan. Though its affluent, highly-educated readership is attractive to advertisers, some media observers have also noted that the Observer’s appeal is too narrow as a result. The Observer was first published in September 1987 by Arthur L. Carter, a former Wall Street executive who had previously bought and sold the liberal weekly The Nation. Noted for its distinctive pink newsprint, the Observer made a name for itself by chronicling the city’s business elite. Veteran journalist and editor Peter W. Kaplan ’76, the editor of The Observer since 1994, has been searching for someone to buy the newspaper from Carter since at least early this year. Carter had reportedly tired of underwriting the newspaper’s consistent red ink. Jared Kushner’s father, Charles B. Kushner, is a prominent property developer who has donated heavily to Democratic candidates over the years. He was sentenced to two years in prison last year after being charged with tax evasion, witness tampering and making illegal campaign contributions. The elder Kushner also gained notoriety for hiring a prostitute to seduce his sister’s husband, videotaping the affair, and having the video sent to his sister. Kushner admitted that he did this in retaliation for her having cooperated with an investigation into his business activities, according to The Times.